HAL’s Light Combat Helicopter (LCH) completed performance trials paving way for finalisation of the basic configuration. 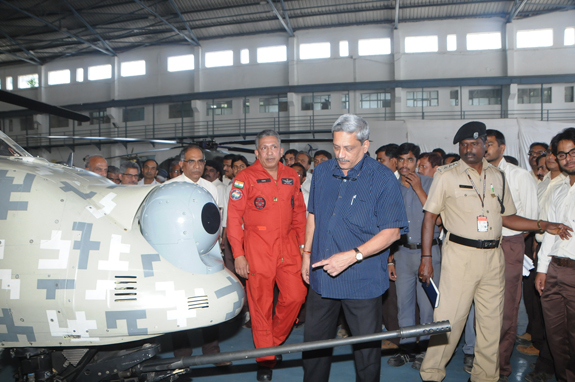 The Defence Minister Manohar Parrikar, visited HAL’s Helicopter Complex in Bangalore recently and had a detailed look at the advanced features and armament fit of LCH Prototypes. “LCH is the only Attack Helicopter which can operate above 10,000 to 12,000 feet altitude with considerable load of armament”, said T. Suvarana Raju, CMD, HAL. Based on successful completion of remaining flight trials, HAL expects Operational Clearance from CEMILAC very soon. G. Gouda, Officiating Chief Executive of CEMILAC (Centre for Military Airworthiness & Certification) handed over a letter on completion of performance flight trials of LCH to Dr. M. Vijaya Kumar, General Manager, HAL in the presence of Defence Minister Manohar Parrikar and T. Suvarana Raju, CMD, HAL. The LCH has completed performance flight trials, which involved not only Development Testing at Bangalore, but also trials at extreme environment conditions such as Sea Level at Chennai, Cold weather at Leh, Hot weather at Jodhpur and Hot & high altitude tests at Leh. Accordingly, the helicopter can be cleared for weapon trials. With the finalisation of the basic configuration, HAL can start production of LCH after the Operational Clearance.